WES families can be found throughout the African continent and currently we have children studying in 12 African countries. 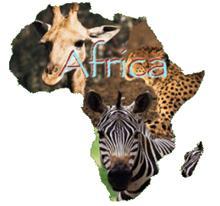 Many families are working in Africa on a long-term basis and remain with WES for a number of years, building up close working and long lasting relationships with their tutors in UK. When possible our families integrate with neighbourhood children to gain the maximum benefit from their experience of living and working in this fascinating and diverse part of the world. In some cases they are able to attend nearby schools and take part in community activities – sometimes local children join WES families and enjoy sitting in on their lessons! Parents are employed in a wide variety of areas and we have doctors, missionaries, mining experts, farmers, nurses, teachers, game wardens and conservationists all educating their children at home using WES courses. The world can be very different for WES families relocating to new lives in Africa. One WES grandmother reported that her daughter was making a meal for a number of guests prepared entirely in a biscuit tin in the ground! Some families live in such remote areas that they literally wait for passing strangers so that they can get their WES assignments posted to their tutors!